Problem prevention--Get the students to school and home on time in sound condition so their educational civil rights are not violated! 1. Shorten the maximum route duration times and create routes that adhere to them;enforce limited time travel where granted by an IEP. 2. Create routes that prevent unnecessary travel time and idling time by minimizing number of school sites + pickups per bus; instead, factor in more than the current 90-second grace period for students with disabilities to meet their a.m. bus and enough time for seat belts, wheelchair harnesses, car seats to be secured. 3. No more hot buses or freezing cold buses! Maximize climate control on the vehicles, preferably with HVAC technology that is at least as energy efficient as city buses. ​4. Improved training for all drivers and attendants. Uniform training including first aid, disability awareness/acceptance, bullying, car seats, harnesses, bus evacuation drills. Update the modules parents created years ago; allow parent leaders to vet the training vendors and to do quality control visits or presentations to training in progress. 5. To further prevent bullying, restrict the range of ages and IEP classifications routed together on each bus (split K-12 category into smaller groupings and be sensitive to needs of those with and without emotional disorders). 6. Hire attendants on ALL routes-- general education students also need supervision. 7. Recruit and retain enough drivers, attendants and mechanics to staff enough buses in advance of school day one (using the number of routes that existed the previous November; apply Employee Protection Provisions across the industry to promote continuity of the workforce. 8. Proactively inform families (thru backpack mail) &amp; schools on busing rights including: how to get accommodations; how to add busing when changing schools or housing, especially for those in shelter system; how to complain to a borough director; how to seek a variance. Make forms accessible and available in more languages. 9. Make it practical for bus crew and student´s family to communicate about delays. Make sure companies and OPT customer service hire people to actually answer the phone, rather than hanging up on parents, lying to us, or insulting us. 1. The Mayor can follow through on his Yes response at 2013 candidate forum that DOE will seek recommendations from an independent commission on school busing, with representation from disability advocates, unions and parent groups, on standards for screening bidders, creating routes, safety, training, and fair labor practices. 2. 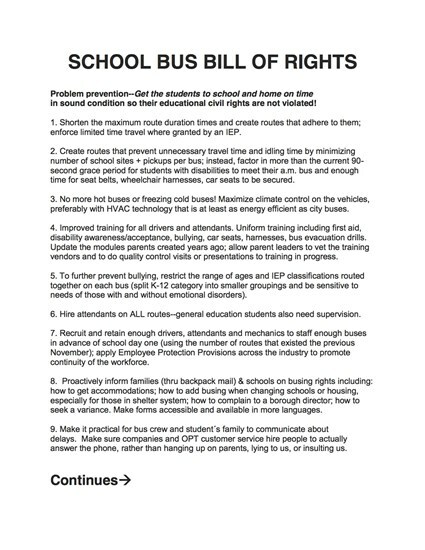 City can implement civil rights law firm´s proposal that they create Busing Liaison position, independent from OPT and the bus companies, whose only job is resolving bus complaints. 3. Promote and fund school-by- school team approach involving educators, parents, and bus workers for understanding riders and resolving conflicts in a restorative way. 4. These same parties assess the route rosters toward end of school year and advise OPT on what stays the same / what changes. 5. DOE should share the innovation proposals that were designed after 2013 focus groups but never implemented. 6. System of Route clinics at start of year with paid time for participating on-the- ground experts like driver, parent coordinator, router (Boston model). 7. Fund a community-based program of monthly borough meetings involving parents, drivers, company, OPT staff to make corrections and share information. 8. Protocols for special situations eg. accommodating family with siblings in different schools-- or in same school but not all qualify for special education route; grant interim services or metrocard to families (especially in temporary housing) who were not properly advised on paperwork requirements while they wait for forms to be completed by health provider and processed by OPT. 9. Conduct Feasibility study for de-privatizing NYC school busing (eg DOT or DOE purchase buses and enforce quality standards as a public service / legal right of the children, not for profit). This could include an audit of OPT and bus company books as compared to the bid specifications. 1.Planee con anticipación, evite el caos –¡pare los despidos a finales del verano! Cualquier vehículo que esté subutilizado el primer día de clases se llenará muy pronto, así que tengalos listos para salir con un equipos completo de trabajadores. 2. Respeto a las órdenes de supervisión adecuada. En los vehículos de educación especial, la proporsión de estudiantes a adultos y el rango de grado / discapacidad deben agruparse conforme los lineamientos que se aplican durante el día escolar. 3. Parar la creación de rutas que confunden a los niños/as con discapacidad que sistemáticamente les hace perder las lecciones de la mañana y / o por la tarde. a) Enforcen las reglas que limitan el tiemp de viaje y aire acondicionado. b) Minimice cambios en la ruta sin ser solicitados. 5. Simplifiquen los itinerarios de los autobuses - limiten el número de escuelas o la hora de salida en cada ruta. a) Equipar los vehículos para sillas de ruedas con cinturones y cordones de seguridad y reposo de cabeceras. b) Restablecer el transporte escolar para estudientas de educación general hasta el octavo grado en Staten Island. c) Enforsar el mandato escolar para trabajar con los conductores y acompañantes para proporcionar ejercicios de evacuación del los autobuses dos veces al año. d) Inspeccionar en materia de seguridad, no como excusas para multar y hostigar a los trabajadores de los autobuses. e) Estudiar la posibilidad de usar cadenas para la nieve y otras necesidades para el mal tiempo. ¡Seguridad ante todo! 8. Mejorar la comunicación sobre cambios urgentes y de largo plazo. 9. Formar un grupo de representantes de organizaciónes de padres, educadores y empleados del transporte electos para que aprueben or negoceen los planes de OPT para lograr las metas antes mencionadas. 10. Mantener empleados del transporte con experiensa, aptitudes y dedicasión: Apoyar el EPP(Acuerdo Mollen) en Albany. 1. Planifye alavans, anpeche dezòd sispann revokasyon fen sezon ete! Nenpòt machin ki pa itilyze sou premye jou nan lekòl la pral ranpli vit ase, pou jwenn yo pare ak woule ak yon konpleman plen travayè. 2. Respè egzije edikasyon pou sipèvizyon apwopriye. Sou machin edikasyon espesyal, elèv-a-granmoun rapò ak seri nan klas / andikap gwoupe ansanm yo ta dwe aliman ak limit ki aplike pandan jounen lekòl la. 3. Youn Stop kreye orè wout ki fè timoun ki enfim toujou manke leson nan maten an ak / oswa apremidi. 4. Respè bezwen fizik ak newolojik timoun yo. a) Aplike règleman sou vwayaj tan limite ak è-kondisyone. b) Diminye sou chanjman espontaneman nan woutin. 5. Itinerè otobis Senplifye limite kantite a nan lekòl oswa lè lekòl lage pou chak wout. 6. SEKIRITE pi wo pase tout! a) Equip machin chèz woulant ak arnachman ak headrests. b) Renmèt jeneral transpò gratis nan otobis edikasyon nan klas 8yèm ane nan Staten Island. c) Aplike manda pou lekòl yo travay avèk chofè yo ak eskòt bay egzèsis repetisyon kòmsi otobis de fwa nan yon ane. d) Enspektè pou zafè sekirite, pa gen eskiz poufè l peye ak arase travayè bis yo. e) Etid posibilite a nan chèn nèj ak lòt move-tan bezwen. 7. Enfòmasyon Pwovokatif pou paran yo ak edikatè espesyal sou kòman yo dwe sekirize dwa transpò sou Pwogram Edikasyon Endividyalize a. 8. Amelyore kominikasyon sou ijans yo, epi se lon- tèm chanjman. 9. Otorize yon panèl ki eli reprezantan òganizasyon ki nan paran, edikatè yo ak travayè otobis oswa apwouve ou byen renegosye plan OPT pou reyalize objektif ki anwo yo ak plis toujou. 10. Kenbe youn ki gen eksperyans, mendèv kalifye ak dedye transpò: Sipò pou EPP (Mollen Akò) bòdwo a nan Albany. 维持经验丰富, 熟练,专业接送服务流冗: 支持EPP (Mollen Agreement) bill in Albany.